The Orangutan Conservancy (OC) encourages all of our supporters to take an active role in “Orangutan Caring Week,” the annual week-long event that draws much needed attention to the crisis facing orangutans. OC is pleased to take part with over 30 other conservation organizations and thousands of concerned people around the globe. Orangutan Caring Week will be held November 10-16. Orangutan Caring Week was created by the Orang Utan Republik Foundation, and is designed to create a “critical mass of concerned voices” for the conservation of orangutans and their habitat. 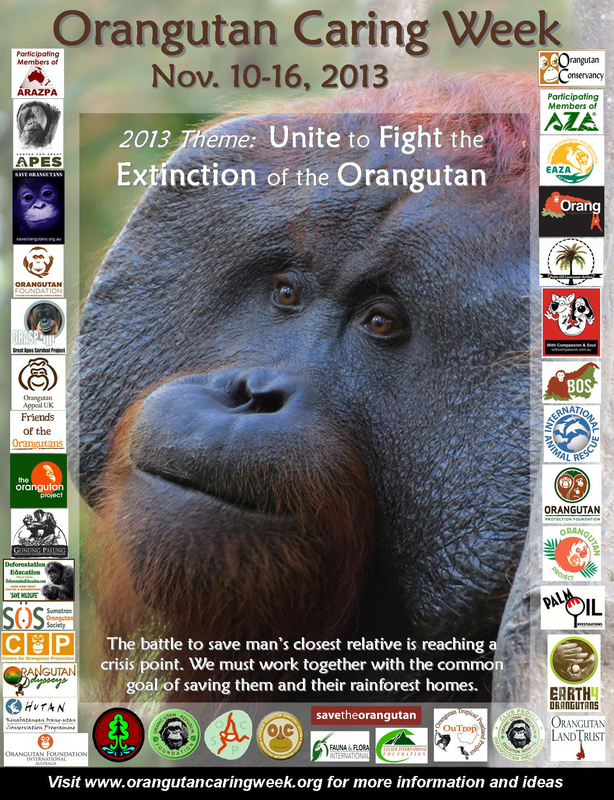 The theme for 2013 is “Unite To Fight the Extinction of the Orangutan,” and that message is needed more than ever as orangutans and their rainforest homes face larger threats today than at any other time. OC will be spreading the word about helping orangutans during this important upcoming week. Please keep any eye on our website and on FB and Twitter too during Orangtuan Caring Week. For more information, and to get some great ideas for things you can do, visit the Orangutan Caring Week website. With so many of us working to save orangutans why are they still disappearing? Can’t give up.